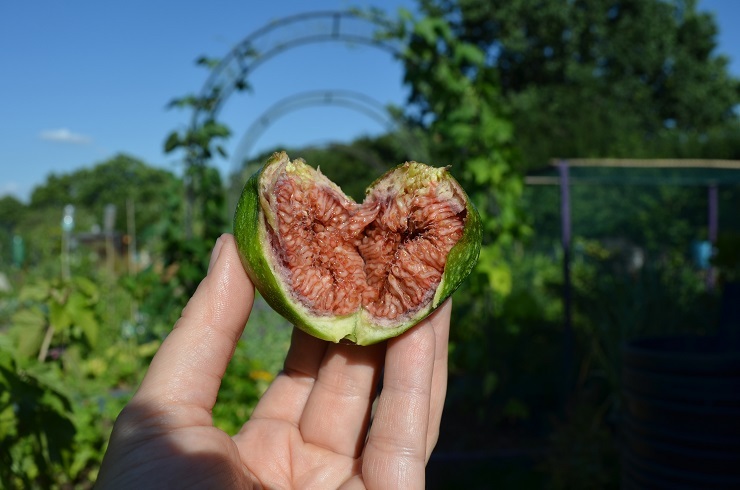 When I got up to the plot the other night there were 4 ripe figs sat on top of an upturned pot outside my shed door. Lionel has a fabulous fig tree and knows how much I love them. They were just perfect, eaten in a break in the watering, with parakeets and clouds racing about overhead and a purry tabby cat at my feet. I gave away some of the remaining gooseberry bushes from my naive ‘will gooseberry cuttings grow?’ experiment (I’m now left with just 5 from the original 19) to the couple a few plots down and was given a big box of delicious blackcurrants in return. This year is otherwise a bit light on blackcurrants, what with having dug up Mum’s best performer earlier in the year, so they are very VERY welcome. I’ve yet to meet an allotmenteer who isn’t happy to share seeds, crops or knowledge, or who doesn’t care passionately about their space. This even extends online – when I posted about blight in the greenhouse people offered to send in seeds on my behalf so I wouldn’t lose out in this year’s tomato seed circle. Our site is very quiet and peaceful, on the borders of the town and usually all you can hear are the roars from the football ground or students testing the limits of their speakers. Which has made a recent spate of break-ins and vandalism a bit of a shock. We’ve had five incidents in the last few weeks, the latest on Saturday night. 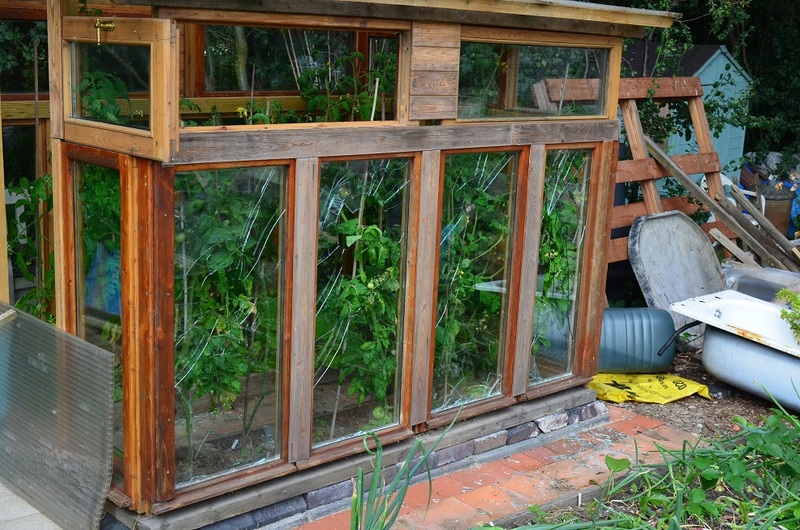 There haven’t been any thefts, it’s mostly involved throwing paint around on the sheds, trashing our loo and, almost inevitably, smashing coldframes and greenhouses. They’re expensive bits of kit, and a few of our members have made their own from doors or old glazing units. At this time of year they are full of really precious crops – tomatoes, melons, chillies, aubergines. The little shits have been luzzing bricks at them. They also set a fire in a plastic compost bin, and for extra titillation put a gas cannister in the bottom. The explosion at least got the police more interested, though there is little they can do. We’re doing what we can. Some of us are staying later to see if we can find out when they come in, though we suspect it’s after dark. I spent a lot of Sunday with a few others from the site, fixing Heras fencing over gaps in the boundary fence and up by our main gates. 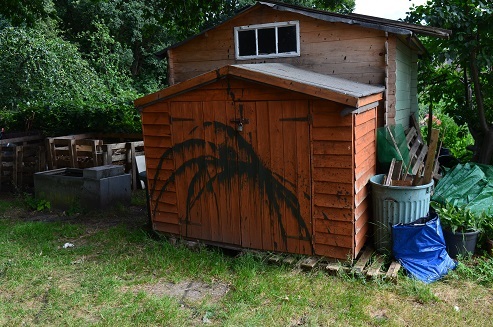 Anti-climb paint is going on the walls we think they use to get in, and brambles are being planted everywhere. 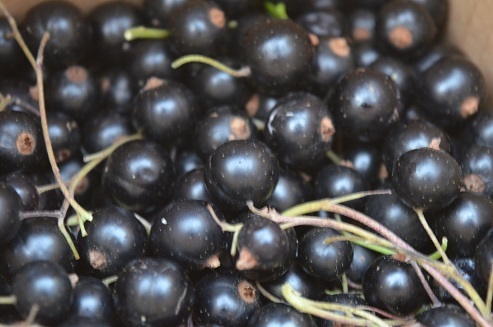 The Fantasia blackberry that was discovered on our site is also blessed with savage thorns. I hope it works. I hope the blackberry does the trick. A productive security fence like that is a nice idea. 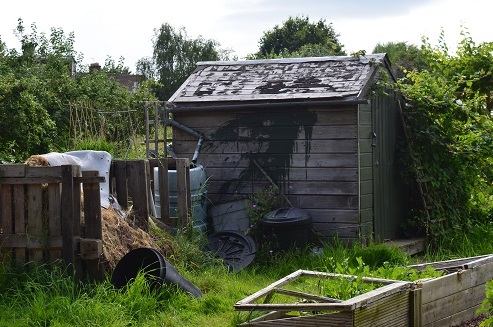 We had a spate of breakins earlier in the year – we were lucky as although they broke the lock on one shed and there was door damage but the damage for us was minimal. Others on our site had it far worse with things having gone missing. Whether stealing or damage the feeling it leaves is the same, sadness and anger and the feeling of having been violated. Hope your site recovers from the damage and not too many plants have been lost. Thanks – very sound words. There’s quite a lot of shock as it’s been years and years since anyone broke in to do damage. They’ve come in to smoke/drink in the woods every now and then, but that’s pretty harmless. Sorry to hear this, it is disheartening I am sure. Keep your chin up and keep on keeping on!